Join the crew for one month or longer during the sailing season. These volunteer positions include room and board on Adventuress. Interns become active members of the crew. On-the-job training is provided and interns will take part in all aspects of programming, gaining valuable experience in environmental and marine science education, as well as sailing and vessel operations. Specific duties will include teaching, sailing, ship maintenance, assisting in the galley, and more. We're always looking for shore support! If you're interested in helping at fundraising events, in the Sound Experience booth at Festivals, or with filing, data entry, and other tasks in the Sound Experience office (located in Port Townsend), please contact Susan at susan@soundexp.org. 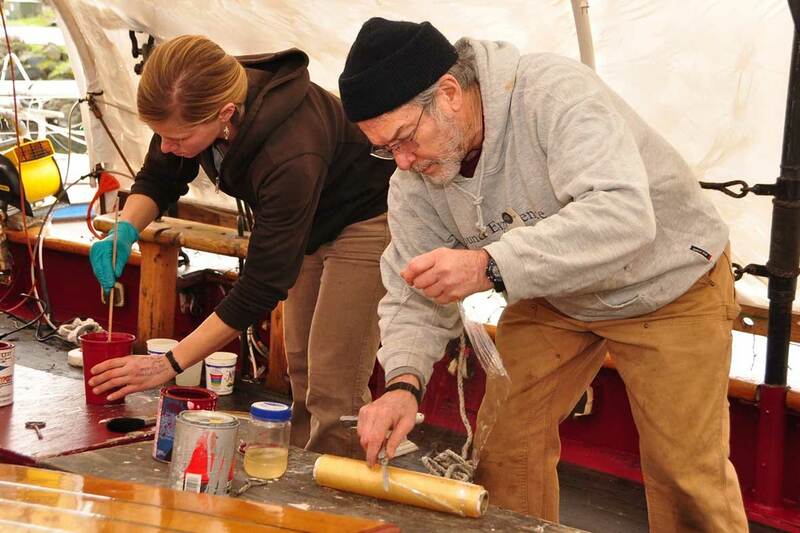 April 6th and 7th, our staff, crew, and incredible community of volunteers will dedicate themselves to preparing Adventuress for another year of service. The April 6th & 7th Work Weekend is going to be one for the books! We are in the final stretch, the last leg, the big push of this incredible project; the culmination not only of the Capstone Deck Project, but of a historical restoration that's been years in the making! So here's your last chance to be a part of history! Come on down to the ship and join our wonderful community in preparing our ship to head back out to sea! This weekend will be all about getting Adventuress ready for her April 12th launch date, this will mean painting the bottom, unpacking our container/workshop, and a multitude of other tasks large and small. 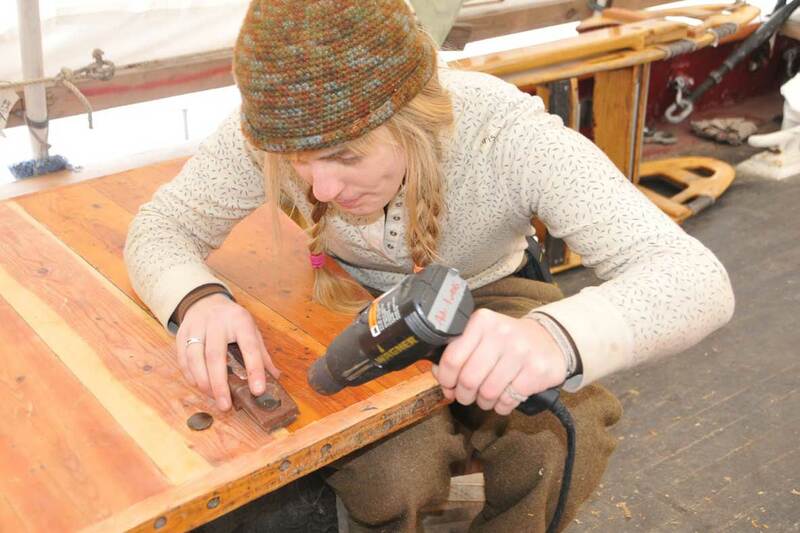 Join us for a weekend of boat work: sanding, varnishing, scrubbing, painting, and helping with all sorts of projects, from mechanical and electrical to woodworking and rigging. We'll find a job for you—we promise. Lunch and snacks will be provided both days. 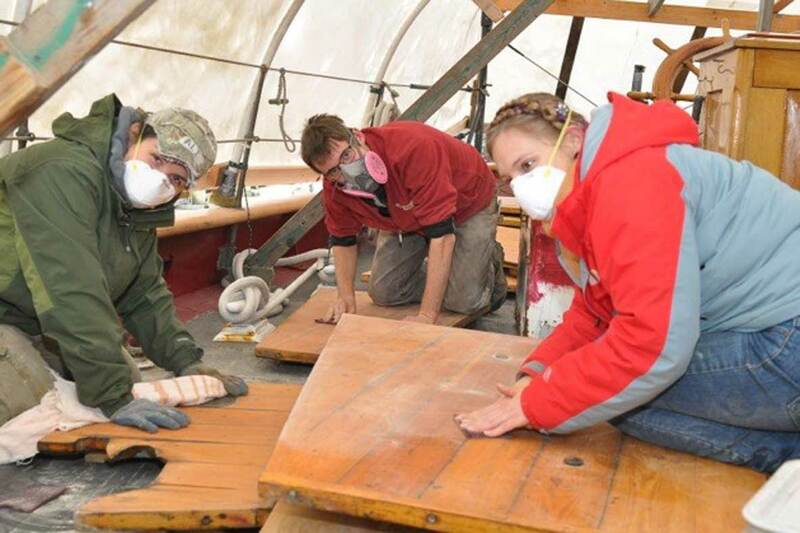 Because of the ongoing Capstone Deck Restoration project this winter, we are unable to house volunteers on the ship. There are some Adventuress community members in Port Townsend who may have warm beds to offer a limited number of volunteers. If you are interested, please reach out to the Volunteer Coordinator. We cannot guarantee housing for the work weekend. Winter work weekends are a wonderful way to get to know the ship and the Sound Experience community that keeps her sailing, and we hope to see you there! 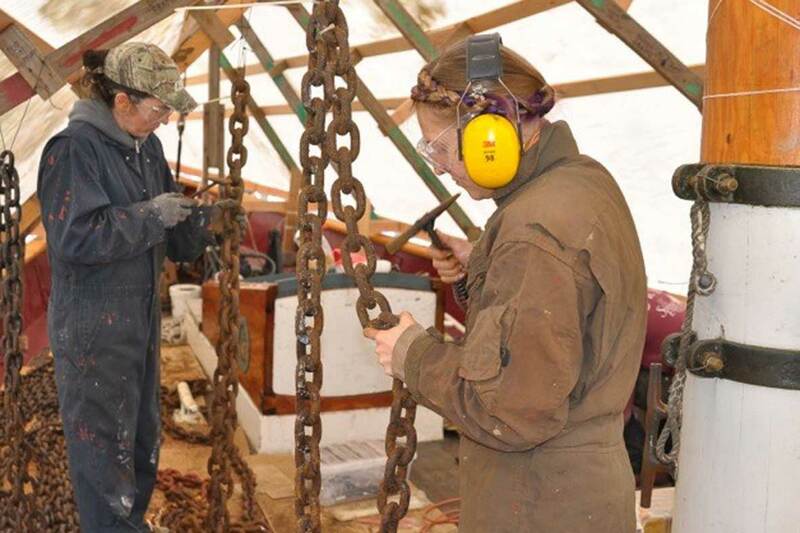 You can sign up for our upcoming March 2019 winter work weekend here: April 6 & 7 Work Weekend Sign-up. Please reach out to our Volunteer Coordinator, Gaia, with any queries at volunteer@soundexp.org. Looking to downsize your tool collection or want to purchase a gift for Adventuress? Then take a look at the wish list below! Please contact susan@soundexp.org. if you are able to donate any of these items. You can also take a look at our wish list on Amazon. In addition to the items on the list, we're always looking for more rags. Is your company looking for community service & team building opportunities in the Puget Sound region? 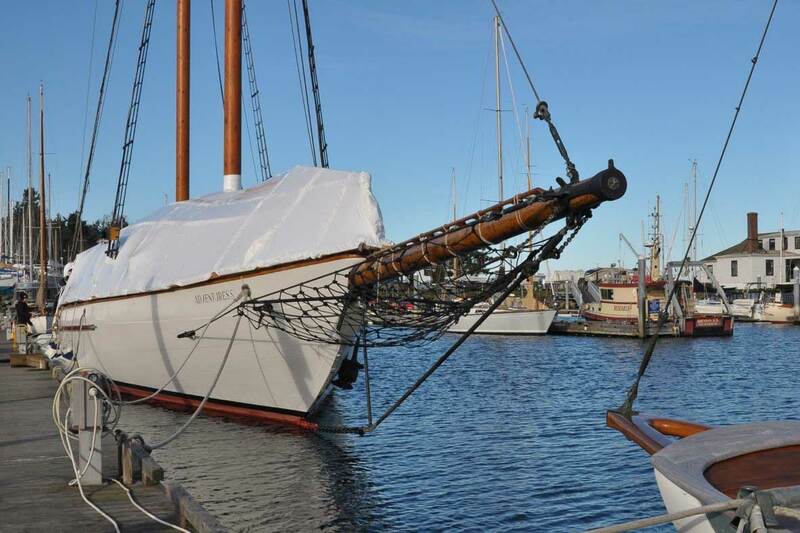 Your organization can join us for a day or weekend to help with essential winter projects like block restoration, varnishing deck furniture, or tarring the rigging! Learn more about the Sound Experience community and tour the ship as she undergoes the final phase of her Centennial Restoration, the Capstone deck restoration project. Contact our volunteer coordinator at volunteer@soundexp.org. for more information and to set up a volunteer day for your organization! Sound Experience is guided by a Board of Directors dedicated to building an effective, sustainable, and lasting organization that sails the schooner Adventuress to make a difference for the future of our marine environment. Additionally, the following board-led committees (some including non board members) move forward key areas of governance: Executive Committee, Education Committee, Ship's Committee, and Marketing Committee. To find out more, visit our page on Leadership Opportunities.